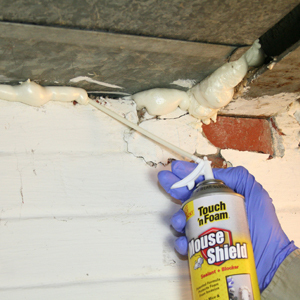 Keep mice and other pests outside where they belong with Mouse Shield Foam Sealant + Blocker. Mouse Shield is specially treated to block mice, birds, bats, tree squirrels and other pests. 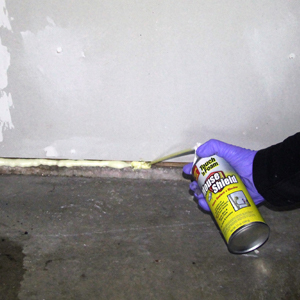 Use it to fill gaps and cracks inside your garage, attic, crawl space, basement, under sinks, around pipe/electrical penetrations or any areas where pests, insects or drafts can enter your home and living spaces. Rough cut openings around pipes, hoses and electrical boxes can be gateways for mice and other pests to enter your home. Spray a bead of Mouse Shield around rough cut openings that surround pipes, hoses and electrical boxes to block out mice and pests. Openings under finished baseboards and unfinished junctions where walls and floors meet can aid the movement of mice and pests. Fill these openings with Mouse Shield to block pests and drafts. Fill gaps where walls meet floors with Mouse Shield, trimming away excess foam. For finished baseboards, remove baseboard panel and fill gaps in floor. Mouse Shield can be trimmed and painted to match up to finished areas. Unfinished basements are prime areas for mice and pest invasions. Gaps where joists meet walls, rough cuts by HVAC and other penetrations can be a catalyst for mice and pest infestations. Fill the gaps around HVAC and other penetrations with Mouse Shield. It can be trimmed flush with walls and around HVAC, pipes, etc. Attics may have small rough cut openings in the corners of the house and at wall junctions that make it easy for mice and pests to enter your home. Apply a bead of Mouse Shield around the perimeter of the base of your attic hatch as well as where the hatch meets the floor. Fill any rough cut openings at wall junctions, and other obvious areas. Both unfinished and finished garages may contain gaps where the walls meet the concrete foundation. There may also be openings where two walls meet at the floor or ceiling. Apply a bead of Mouse Shield along gaps and openings found along the perimeter of where walls meet the floor. Fill any openings at wall junctions, and other obvious areas. 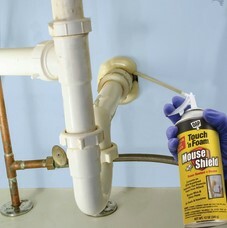 Touch 'n Foam Mouse Shield is a 1-component Foam Sealant + Blocker that contains an EPA-registered pesticide which protects the foam from attack by mice and other pests.